This research investigates the impact of various factors on ethical behavior of 180 not-for-profit hospital employees. 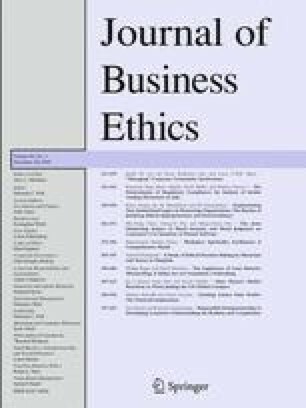 Ethical behavior of peers, ethical behavior of successful managers, and emotional intelligence had a significant positive impact on ethical behavior of respondents. Physicians and hospital employees with political connections within the organization were significantly less ethical than other employees. The results have many implications for researchers and healthcare practitioners. American Hospital Association: 2009, ‹The Economic Downturn and Its Impact on Hospitals’, Journal of the American Medical Association. http://www.aha.org/aha/trendwatch/2009/twjan2009econimpact.pdf. Angier, D.: 2007, ‹BRIEF: Doctor Receives Maximum Sentence: Bay Physician Convicted of Fraud, Distributing Painkillers’, Knight Ridder Tribune Business News. http://gowmu.wmich.edu/cp/render.UserLayoutRootNode.uP?uP_tparam=utf&utf=http%3A%2F%2Fwww.wmich.edu%2Flibrary%2F. Appleby, J.: 2004, ‹Barrage of Lawsuits “Huge Wake-up Call” For Non-profit Hospitals’, USA Today. http://www.usatoday.com/news/health/2004-07-19-lawsuits_x.htm. Deshpande, S. P. and J. Joseph: 2008, ‹Impact of Emotional Intelligence, Ethical Climate, and Behavior of Peers on Ethical Behavior’, Journal of Business Ethics. doi: 10.1007/s10551-008-9779-z. Galewitz, P.: 2006, ‹Tenent CEO: We’re On the Way Back’, Palm Beach Post. http://www.palmbeachpost.com/business/content/business/epaper/2006/03/27/c1bz_tenet_0327.html. Lazar, K.: 2008, ‹Doctors’ Fear of Lawsuits Tied to Added Costs of $1.4b’, The Boston Globe. http://www.boston.com/news/local/massachusetts/articles/2008/11/18/doctors_fear_of_lawsuits_tied_to_added_costs_of_14b/. Mahar, M.: 2006, ‹Do Non-Profit Hospitals Deserve Their Tax Breaks?’, The Health Care Blog. http://www.thehealthcareblog.com/the_health_care_blog/2006/06/do_nonprofit_ho.html. Nye County Comments: 2008, ‹Nevada’s Medical Scandal’ Nye-Gateway to Nevada’s Rurals, http://nyenevada.blogspot.com/2008/03/nevadas-medical-scandal.html. Patrick, R.: 2008, ‹Doctor Convicted in Fraud, Drug Case’, McClatchy – Tribune Business News. http://gowmu.wmich.edu/cp/render.UserLayoutRootNode.uP?uP_tparam=utf&utf=http%3A%2F%2Fwww.wmich.edu%2Flibrary%2F. Plunkett Research Ltd.: 2008, ‹Guide to the Health Care Industry’. Plunkett’s Build-A-Report, www.plunkettresearch.com. The Oregonian: 2006, ‹Hospital Errors: From Hush-hush to a Basis for Boasting’, http://www.oregonlive.com/editorials/oregonian/index.ssf?/base/editorial/1141426506208020.xml&coll=7. Trevino, L. K. and G. A. Ball: 1992, ‹The Social Implications of Punishing Unethical Behavior: Observers’ Cognitive and Affective Reactions’, Journal of Management. http://findarticles.com/p/articles/mi_m4256/is_n4_v18/ai_13928528. Truesdell, C. J.: 2008, ‹Pooler Physician Hung Thien Ly Convicted of 129 Felony Counts of Dispensing Drugs Illegally’. US Fed News Service, Including US State News, http://gowmu.wmich.edu/cp/render.UserLayoutRootNode.uP?uP_tparam=utf&utf=http%3A%2F%2Fwww.wmich.edu%2Flibrary%2F.